After defeating Owen Shaw and his crew, Dominic Toretto (Vin Diesel), Brian O’Conner (Paul Walker) and the rest of the crew are able to return to the United States and live normal lives again as they had wanted. However, Owen’s older brother, Deckard Shaw (Jason Statham), is after Dom and his crew, seeking revenge for his brother’s death and putting the entire crew in danger once more. After learning of Han’s death, the crew sets out to find the man who killed one of their own, before he finds them first. If you have watched the previous instalment (Go watch it if you haven’t), you would have known that Hans was killed at the very last part. The 7th instalment started somewhere around there and the tension escalated quickly. If you think the 6th instalment’s “biggest and longest plane fight” was over the top and unrealistic, this instalment’s flying cars beat that hands down. What’s better, it’s REAL and Over-The-Top. I love the fight sequence in Furious 7. While it’s more choreographed, the camera was actively carrying out the sequence with the fighters (think Go-Pro), going crazy together with the punches and topples, drawing me into the film… There were plenty for you to look out, Brian O’Conner (Paul Walker) VS Kiet (Tony Jaa)’s fights x2; Luke Hobbs (Dwayne Johnson) VS Deckard Shaw (Jason Statham); Dominic Toretto (Vin Diesel) VS Deckard Shaw’s double ‘street’ fights, and of course, Letty Ortiz (Michelle Rodriguez) VS Abu Dhabi Prince’s bodyguard Kara (Ronda Rousey)’s wrestle. To say that I’m being ‘kept on the edge of my seat’ was an understatement. I was almost holding my breathe (Yea, I know it’s not possible to hold a breathe for 2 hours and 17 minutes), but the suspense and thrills just kept coming one after another. Crazy races, Laughters, Tension, Fights and then it repeats. You know how watching trailers sometime spoils the whole film because all the exciting scenes are being publicized and watched already? I though Furious 7 would be so, expecting all the trailer scenes at predictable moments, but I still couldn’t help but be in awe with the camerawork. Furious 7 is of course, not just about the actions and cars. The humour was ingenious, and this is something I’m not willing to spoil, the fun will be taken away if I do so. I like how the characters were carried out in the film, it’s just like watching the characters in Friends, in Charmed, in Harry Potter. They are the characters, and the characters are them. You can’t say it’s acting, because I can’t see the acting anymore (perhaps only for the parts where Paul Walker’s face was digitally imposed on his brothers), his chemistry with Brian’s wife Mia Toretto (Jordana Brewster) might be good, but it’s still not him. Good luck trying to spot which’s real. I won’t be the last person to gush and cry over the final tribute. Narrated by Vin Diesel, I was feeling all confused. Was this from Vin himself, or was it from Dom? Before this, I get emotional easily when I see deaths and people crying. But here, James Wan made me cry with CARS! I’m not going to type anymore to spoil it any further. If you think reading this review or spoiler (you may call it) is good enough, you are wrong. Forget Insurgent, this is a definite MUST-WATCH if you are a movie-goer. I’m not even referring to fans whom have been growing up with the franchise team and I’m definitely not saying that because it’s Paul Walker’s last film. If anything, I salute Director James Wan handling the Furious 7 in the best way possible, and I can’t wait to watch the film again. For the actions. For the Comedy. For the thrills. For the flawless ending. Production on the film was halted on December 1, 2013 following the tragic death of Paul Walker, who was killed in a car crash on November 30, 2013. Shooting had been underway in Atlanta and the film was scheduled to be released on July 11, 2014. Director James Wan and Universal executives held a conference call to determine how to proceed with the production in a manner respectful to Walker’s memory. Walker was nearly half way through filming at the time of his death. Although there was some consideration about scrapping the film altogether, the film eventually resumed productions following rewrites to address Walker’s absence and give his character a proper send-off. Body doubles, stunt doubles, and CGI were used to complete the film following Paul Walker’s death. Walker’s brothers Caleb Walker and Cody Walker were among the doubles, and also provided voice over for the character Brian O’Conner. Viewers who pay careful attention will note that the majority of Walker’s unfinished scenes are completed using his brothers Caleb and Cody as doubles. When combined with CGI, carefully chosen camera angles and the right lighting, they are the spitting image of Paul. Walker is not the first actor to get temporarily revived through visual effects. Oliver Reed was digitally recreated for his unfinished scenes in Gladiator when he passed away during production and Nancy Marchand had one final scene on The Sopranos after her death. And then there are the countless commercials that resurrect iconic celebrities like Steve McQueen and Bruce Lee to hock modern products. There’s less CGI in Furious 7 than the previous ones. The sequence happened over the Arizona desert with a C-130 and five cars – they had doubles of each, with 10 cars, each car made either two or three drops out of that plane. This marks the second car-centric film Tyrese Gibson and Jason Statham have been in together, the first being Death Race (2008). First sequel in the franchise since 2 Fast 2 Furious (2003) to not be directed by Justin Lin or feature co-star Sung Kang. Ali Fazal, a Bollywood actor, has a cameo role in this movie. Tony Jaa’s first English-speaking role in a film. Check out Fast and Furious 7 Official website and Facebook Page! 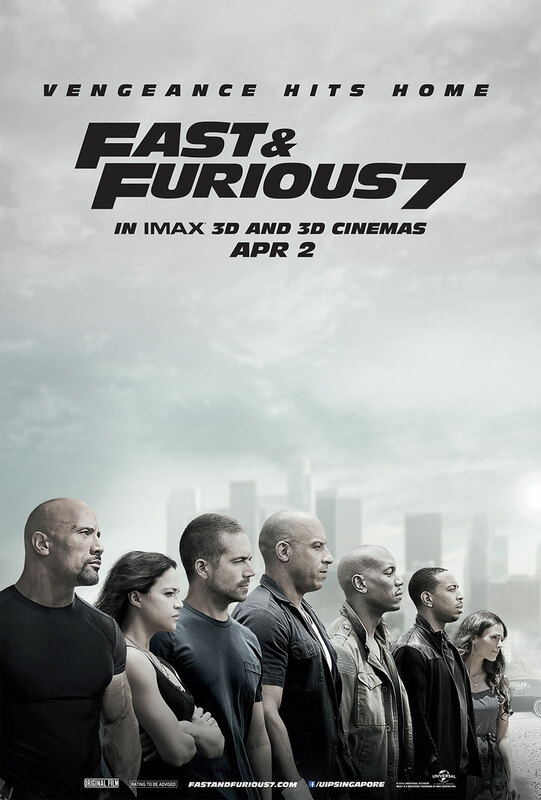 Fast and Furious 7 is out in cinemas on 2 April 2015. I still have yet to go and see this movie but I’ve heard great things about it. Might go sometime this week. Movie of the year! Gonna watch this soon. You has ne mesmerized by your thorough and moving frview. I plan to see this one. nice review. This is one film that is generating curiosity to many. A must-see one for me. I still haven’t watched the film but will try to squeeze it in during the weekend. It’s really unfortunate that Paul Walker passed away, he could have contributed to more FF films. It’s also great that he got a proper send off. So many people is talking about this movie.. I think it’s worth a watch then..
I’m sooo glad you didn’t have any spoilers, glad to know they have a lot of great actors on board, and I would love to see that Ronda vs Michelle fight scene! I am not a big fan of action movies but have heard about this movie alot. SUrely going to watch this movie. Love how they ended the film. It’s really a tribute and proper way of saying good bye to Paul. For sure people who followed this film from the start cried buckets. Big fan of Fast and Furious series! Haven’t seen 7 yet but have to catch it soon. Paul Walker’s untimely death is really sad! I’m dying to watch this movie! Thanks for the detailed review that still doesn’t spoil it for us who haven’t seen it yet haha. Cheers! I totally feel you when u said u “held your breath” for 2 hours and 17 mins, haha! Haven’t caught the show yet, but i can’t waitttt! *Sad to think about PW once again though..